STYLE AND GRACE- Make a bold statement without compromising the safety of your personal data! Our men\'s RFID blocking card holder wallet is made with genuine Italian leather for an extremely lavish yet classy feel! Minimalist design, deep attention to detail and modern contemporary style, this card holder is simple yet powerful, a must for any man! Flawlessly merges with formal or informal outfits, perfect for any occasion! COMPLETE PEACE OF MIND - Protecting your important personal data, financial & family info is critical! 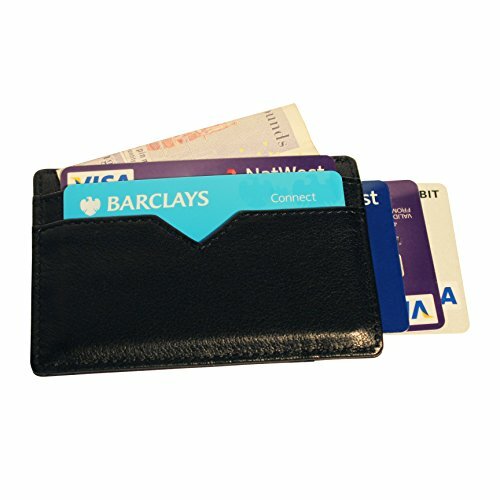 With increasing cases of identity theft around the world & cyber hackers, our men\'s RFID blocking card holder wallet has you covered at all times- literally! The uniquely advanced blocking technology blocks RFID signals and protects your private information stored on RFID chips from illegal scans. Fully lab tested for frequencies of 13.56 MHz or higher, your peace of mind is assured! GREAT FOR GIFTS - Perfect gift idea for friends, colleagues, family or loved ones. Our RFID blocking card holder wallet for men ensures fraud protection against cyber thieves and identity criminals. Great gift option for birthdays, anniversaries, valentine\'s day, father\'s day, weddings, promotions etc! Help your loved ones in safeguarding their critical personal and financial information by showing your genuine care and affection! Make your gift stand out from the rest! Great peace of mind, excellent quality.